Are Natural Stone Window Sills A Necessity or a Luxury? Well, this really depends on your perspective as a building contractor, what your budget is and what kind of contracts you’re bidding on. For instance, if you typically win bids for high-end construction projects, then natural stone window sills will be considered the normal material to collect just like cement! Some might argue that natural stone window sills aren’t a necessity at all and that it’s simply a luxury that’s not a good investment for lower-grade homes. The fact of the matter is that natural stone window sills benefits any dwelling. While it’s true that you have to be well aware of your building budget, the overall benefits are going to only reward the buyer and the seller—and the future buyers and sellers to come because natural stone will last that long! Wood – Over a period of time, even treated wood is going to rot and attract bugs, critters, termites, and other unwanted pests. Wood is also very sensitive to water. So placing any kind of container with condensation will leave an unwanted watermark. The result is usually covering it up with paint, but even then, that eventually peels and chips leaving about another hazard if there’s small children. This could also be a liability if this is a public dwelling. Vinyl – Vinyl is a little better because it’s lighter and comes in a variety of colors that won’t strip, peel, or chip off. The disadvantage is that vinyl does tear, and if it endures enough harsh conditions, even dent. Long story short, vinyl will also need replacing at some point. Natural Stone – Now, this is a winner for all dwellings because natural stone window sills will last a lifetime. It’s a great selling feature because buyers want to always be reassured that they are getting their money’s worth, and nothing reassures that than a marble or travertine window sills. These types of window sills won’t tear, bend, or fold. Its beautiful unique veining patterns will never need a coat of paint. Its timeless look has been proven to last for centuries and is applicable to almost any kind of décor. 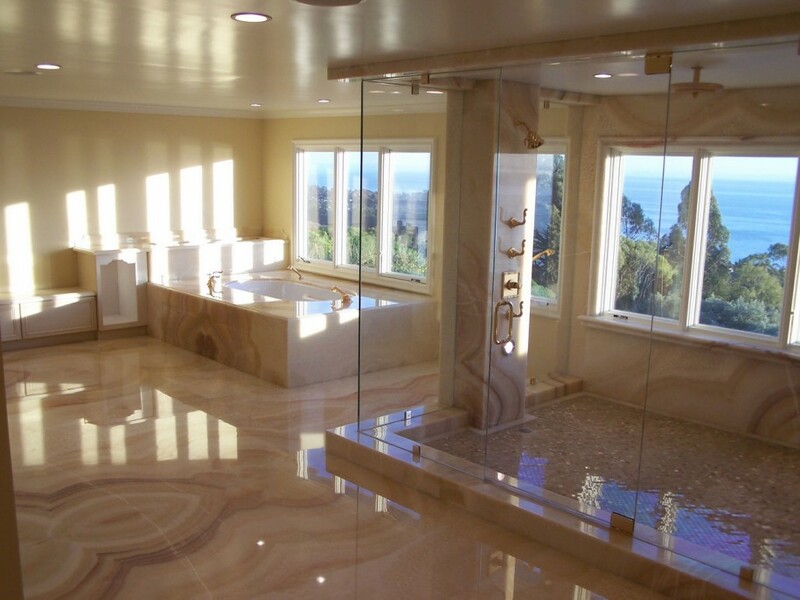 Natural stone is just a beautiful, high-quality material that’s admired and appreciated across the globe. Natural stone window sills, marble in particular, transforms a home or office space into something elegant and regal. It gives an extra layer of feng shui to a space suggesting that the area they’ve entered is something unique and special. For commercial buildings, marble window sills provides an extra level of elegance that may offer clients the reassurance that they’re receiving quality service; because if a company is taking the extra step in investing in their window sills, then surely business is going well, which means that the type of business/service that they provide is satisfactory. In short, natural stone can be equated with success. It could be said that everyone wants some type of natural stone marble or travertine window sills in their home and office. Quality marble and travertine window sills simply sets another standard of the quality, whether it’s in the lifestyle or professionally. As a building contractor, or a natural stone reseller, you’re looking to stock the product that sells. And if you know that marble and/or travertine window sills will sell, then it’s your responsibility as a business professional to provide your clients with the option of natural stone window sills. Even if your business is building more low-end dwellings, stocking natural stone window sills really won’t bust your budget if you buy them in bulk. Stonexchange sells our quality window sills in crates of 50 or 100. Your supply of natural stone window sills are carefully packed with special packaging and handling and can be shipped directly to your warehouse or building site. Our marble and travertine window sills can also be used for other features. For instance, the dimensions of a natural stone window sill typically measures in increments of 1″ (3”,4”x 4 ½”,5”,6”,7”,8”,9”,10”,11”,12”), being 3” to 12” wide. This makes our sills perfect for built-in shelving, vanity trays, and even for window seats! Of course, for natural stone window seats, you’ll have to place a special order with Stonexchange as larger dimensions will have to be cut directly from our quarry overseas. The estimated delivery time for overseas orders takes approximately 8-10 weeks. So Is It a Necessity or Not? The natural stone window sill is indeed a luxury, but if you’re looking to see a better return on your investment, you may want to start looking at it as a necessity. It’s all perspective really, and how aggressive or conservative you are with your business. If you’re looking to turn over a profit a bit sooner, then you might have to get something that shines a little, and what does that more than marble window sills? Contact a Stonexchange customer service representative to learn about how you can stock your discount marble and travertine window sills today at 305-731-2400!